1.I am glad to be present amidst you today for the dedication of Shiv Nadar University to the nation and the presentation of the HCL Citizens Grant Award. To begin with, let me compliment Shri Shiv Nadar, the founder chairman of HCL, for his vision in the field of higher learning. His Foundation, set up two decades ago, has become an important platform for transformational education. 2.The Foundation has set up landmark institutions spanning the entire education spectrum from schools to universities. Shiv Nadar schools are emerging as an important chain of progressive schools in the National Capital Region. VidyaGyan, an innovation in school education, reaches out to the ‘top of the bottom of the pyramid’and creates leaders from all cross-sections of the society. India needs such powerful concepts in inclusive education as VidyaGyan to build a successful and empowered future. 3.Shiv Nadar University was established in the year 2011. It was started with the goal to become a comprehensive, multi-disciplinary and student-oriented institution focused on creating new knowledge and producing competent professionals. The university has since adopted a distinct curriculum to nurture students for the exciting opportunities of tomorrow. Its unique approach has the potential to positively influence the higher education landscape of our country in the next two to three decades. 4.After our independence in 1947, we embarked upon an economic development programme. The necessity of having quality manpower in sufficient numbers dawned upon our policymakers. Creating a human resource pool became one of the critical focus areas in our socio-economic agenda. As a consequence, the higher education sector has seen phenomenal expansion in post-independent India. From 20 universities in 1950, we today have 712 universities. During this period, the number of colleges has increased from 500 to over 36,000. 5.We today have renowned technical institutions like IITs, NITs, IISc / IISERs, IIMs and national law universities to provide education in areas of professional competence like engineering, science, research, management and law. Some of the private institutions have ably complemented the efforts of the public sector institutions in meeting the high demand for tertiary education of our society. 6.Private institutions account for about sixty percent of the students enrolled in higher education. Though proliferation has led to greater access, its negative fall-out on standards is alarming. If the declining quality of education particularly in the area of higher learning is not reversed quickly, we will land ourselves in a scenario of having a large number of people with degrees but not enough manpower with proficiency. 7.We cannot afford to produce workers and professionals who fail to meet the skill levels required by a growing economic system. Hence, access to learning opportunities and the pursuit of excellence must both receive equal attention. I am happy to inform that in 2015 two Indian institutions for the first time have been ranked within the top two hundred universities in international rankings. I am confident that many more will join in the coming years. I have been repeatedly saying that in a manner similar to ancient times when India led in the field of higher education, today also, our institutions of higher learning must come up to international standards. 8.Shiv Nadar University, which has built an impressive infrastructure, should be able to replicate these achievements here. Its large campus of 286 acres should contribute to arich scholastic environment. Its residential character should help to nurture a strong culture of exploration, collaboration and dialogue. Its schools should offer innovative courses in engineering, sciences, humanities, management and entrepreneurship. My confidence in this university stems from the fact that the two thousand students enrolled in its various programmes are taught by quality teachers including faculty from renowned institutions abroad. This cross fertilization of minds and intellect is very important. 9.For a country like ours which has a significant young population, we can leverage the demographic dividend through a holistic education model that takes into account the uniqueness of individuals. However, the demographic dividend could also turn into a liability if we cannot provide our youth job skills to improve their employability. The importance of research in universities is paramount. Research is central to developing effective academic systems. 10.It is gladdening to learn that the Class of 2015 of this university have either bagged lucrative placements in reputed organizations or have secured admission for post-graduation in top universities. You have a great future ahead. You will make your families and your alma mater proud. By following the values of perseverance, commitment and hard work, you will raise the bar of performance and excel in your chosen field. 11.You have all grown up and received education in a technology-driven world. You fully understand the power of technology as a tool of change. Blend your technology skills with your compassion to find solutions to the problems of the less fortunate brothers and sisters of your community. By this way, you can build a better future for your country. You can repay the trust that your countrymen have reposed in you by fulfilling your social obligations. 12.Excellence in education is but a road to a higher cause. Success is ultimately gauged by the transformations brought about by educated individuals. Inclusive development, for one, is a barometer for a society that has leveraged the force of education well. For that to happen though, greater engagement at the grassroots level is called for. Many non-governmental organizations (NGOs) are doing commendable work in rural India in various sectors. Much more can be done if this voluntary sector is strengthened. The HCL Citizens Grant supports and facilitates the institutionalization of NGOs through the creation of strong governance framework and management capability. 13.I take this opportunity to congratulate the first winner of the HCL Citizens Grant Award. The HCL Foundation has committed one hundred crore rupees over the next five years towards this grant. As this grant is intended to bring in better governance into the social sector system, it will benefit all stakeholders in the long run. 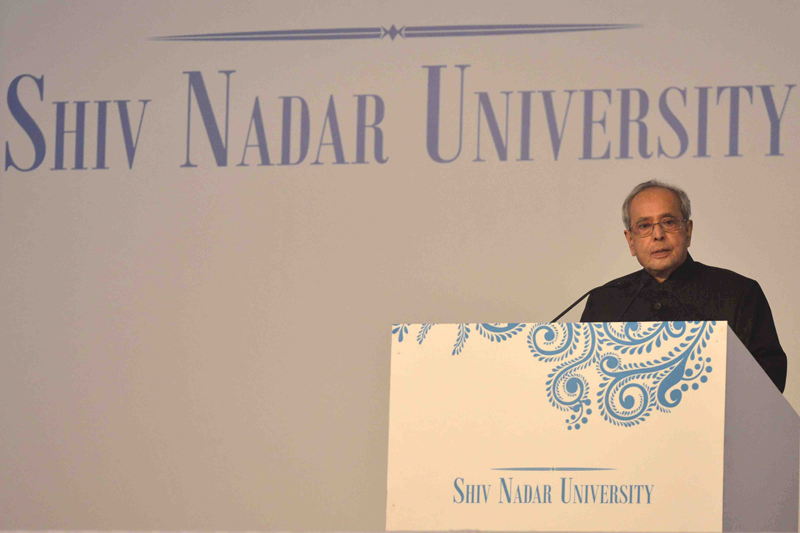 I applaud the Shiv Nadar University for taking the lead in connecting the industry to the cause of social uplift. 14.With these words, I conclude. I thank you all for inviting me to this function. I would like to advise the young students present here to move ahead. There is no question of looking back. The world belongs to you. The skill and knowledge which you have acquired will help you in moving ahead and solving problems one by one. I wish you Godspeed and all success in your future endevours.